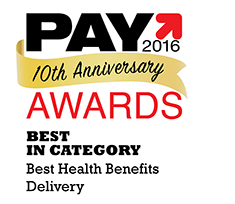 Paybefore has honored TASC with the 2016 Best-in-Category award for Best Health Benefits Delivery. Paybefore has honored TASC with the 2016 Best-in-Category award for Best Health Benefits Delivery. For 10 years, “Pay Awards” have conferred the most prestigious recognition of excellence in the worldwide prepaid, mobile, and emerging payments industry. TASC was selected by an expert panel of judges who evaluated nominations from around the world. Located in Madison, Wisconsin, TASC is an industry leading third-party administrator of benefits accounts, compliance, and payroll services for more than 60,000 sole proprietors, family farmers, and businesses. TASC’s services include AgriPlan, BizPlan, COBRA, ERISA, FlexSystem, FMLA, HRAs, HSAs, Pay Roll, and Retiree Billing.